My name is Hamid Choughale I bought your program about two years ago and renewed for another year. Unfortunately, when I first bought your material I did not do as instructed. However, this year I started prepping for the FYLX at the beginning of the year and using your techniques I was able to pass. I can attach the BAR results and official paperwork if you don’t post it due to my address and name. I am embarrassed that two exams were sub-par mostly because I freaked out on the race horse part and mostly because my typing speed sucked but over all with the MCQs I got through it. I did notice that my lowest score on the written exam was countered by a very good score on my MCQ so exam writing and knowledge of the subject are not always a correlation. Your concise written structure on exam writing helped immensely. “By the way, Colby and I have been using the study methods from the CD you sent me over the summer. We just took our evidence midterm a few weeks ago (our professor is Lynn McClain, who literally “wrote the book” on Maryland Evidence)….and I got an “A” (there were only 5 A’s in her classes, combined- about 200 students) and Colby got a B+. The attachment is an image (jpg) of the first page of the exam, with my grade. She also handed out “sample full credit answers from your classmates” and guess who’s were included?? MINE!! It made a world of difference, knowing how to study and what to do. Please tell Dean thank you! P.S.S. I’ve been getting all A’s since I talked to Dean and started using your study materials. I even got 1 of only 4 A’s in Evidence last semester!!! Just wanted to let you know that I passed the FYLSE first time around. I scored an 85 on one of my Contracts essays and 88 (raw score) on the multiple choice. I want to thank you for what you are doing. I unhesitatingly credit the MAD method with my success. I built my outlines, spent much time in the mountains walking around memorizing, tested myself with MCQ’s and wrote many of the previous 15 year’s FYLSE exams. I never got to 150 essays – I reached about 115. I fell down a bit on the Dissertation because my penmanship is horrid and I never learned to type (I am proficient with about 5-6 fingers total when I type). The hardest aspect of the FYLSE was simply the way they manage to construct such a high pressure atmosphere. I just wanted to write and let you know I passed the FYLSE!!!! Thanks to your program and way of teaching and instructions on how to learn I passed and so did the other student I study with who purchased your product after I told her how great it was! My only regret was not purchasing it sooner – I could have done so much better throughout the school year! I got 2 65’s and 2 75’s on the essay portion and an 89 on the mcq portion of the October FYLSE!!!!! I want to thank you for your product….I had taken and failed the FYLSE twice….I purchased your product, followed your system and passed it on my third and final attempt!!!!!! This message is intended for Dean, though I know others might read it. I just wanted to say thanks for being a word we don’t use in polite company during my first year. I’ve managed to do pretty well in law school thanks in large part to RomLaw and the tutoring. As I start studying for the bar, however, it seems as though everything’s come full circle. I’m starting to fully appreciate the value of what I thought was so tedious and demoralizing during my first year. I still think you’re an *******, Dean, but the best kind. Thanks. Just my very humble opinion, I have the LEEWS material and I am a bit disappointed. I also have PMBR, FINZ, and ROMLAW Baby Bar preparation materials (www.bsmsphd.com). I am most pleased with the ROMLAW, I do not mean the ROMLAW case brief tool, but the ROMLAW Baby Bar prep course specifically. Tyler’s Nailing the Baby Bar is good also and helped me a lot in learning to do essays, but I believe it’s far to condensed to get one through the FYLSE. I am most pleased with the ROMLAW, I only wish I had it at the beginning of 1L, it would have saved me so much time and taught me three times more law than I learn going through CU 1L. It left me with the firm belief that CU did not prepare us very well for the essay portion of the FYLSE. ROMLAW fills in all the essay witting blanks that you knew were there someplace but did not know how to spot. If I had it to do over, I would not outline at all in 1L, but use the material ROMLAW provides. However, I would say one need 3 months, and 3+ hours a day or more to cover the ROMLAW material (Torts, Contracts, Criminal). ROMLAW has an 88%+ (based upon individual specific count) pass rate for the FYLSE, and I now understand why. I have no affiliation with ROMLAW other than I have purchased their Baby Bar course. Actually thank you for offering the product. Are you the creator/owner? Anyway, the product has allowed me to spend more time with my family. If I had to brief every case my family would never see me! Plus, there are many nuances I miss when reading the casebook that the product shows. I have convinced everyone I know of how great the product is! “Difficult” is appropriate:) I knew going in that it would be hard, but I think I greatly underestimated the work load and the difficulty of balancing everything. Trying to be there enough with my 5 yr old daughter, 2 yr old son and wife while still “competing” for grades has been at times overwhelming. 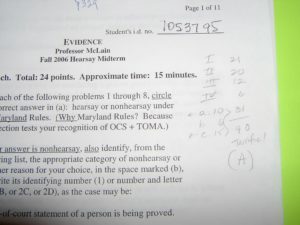 I used their (my school thomas m cooley in lansing MI) methods to study and issue spot and exam writing on practice exams and I miss issues and my answers are nowhere near the “model” answers of my profs. I use your methods to issue spot and study and write my exams and my answers are closer to model answers my answers are shorter more to the point and I don’t miss issues. Guess who I believe and who I think is an idiot? when I do things your way I know what I don’t know then dissertate on it and then my exams improve. I also rewrite my answers to build skill and confidence. Am I on the right track? Why are academic support folks so useless in law school? I only have 2500 hours in a semester to study, sleep, eat and attend class. I work 40 hours a week and drive 250 miles – one way from Cleveland, Ohio to Lansing, Michigan where I attend class on weekends only, at Thomas M. Cooley Law School. I still have been able to be on Dean’s List 2 of the 4 semesters I have been there. How do I do it? Simple – listen to Dean on .MP3 in addition to all the Study partner products. I had your materials during the first semester but I didn’t look at them. I listened to my profs and my grades suffered. Used your stuff in the second semester and everything is fine…. I got my first grades today: a 99 in Civ Pro, a 98 in Torts, a 88 in Contracts, and a 86 in Real Property. I would have done better had I followed all the advice I got from your exam writing books…I really can’t stop laughing…. your stuff is real cool and it shows you the only way to do it. I got my first grade today and it was an A in Torts….everybody told me not to memorize the law like your exam writing books said to. They were wrong…. very very wrong…. I’m glad I listened to you. I got all A’s and one B+. It works.